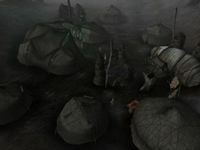 The Urshilaku Tribe is one of the four Ashlander tribes of Morrowind. The ultimate traditionalists, living right on the northern coastline of Vvardenfell, the Urshilaku seem at first the most conservative of all the Ashlanders - guardians of the Nerevarine Prophecies, and thus in sympathy with the Dissident Priests. Yet they are the only clan that is willing to extend enough friendship to outsiders to actually name them Clanfriend. And also their rigid conservatism isn't quite as rigid as it might seem: when it becomes clear that the Nerevarine will be an outlander, possibly not even an Elf at all (let alone a Dunmer), the Urshilaku are the first to accept the new interpretation of the prophecies. Lammak Urshilaku was the founder of the tribe. This page was last modified on 19 September 2018, at 13:51.